#259 Vintage TWA 747 Passenger Airliner ! 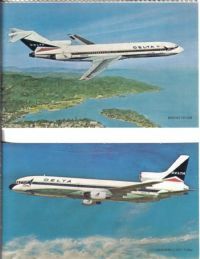 Here's a nice old Dexter Chrome postcard view of a Trans World Airlines 747! Card is continental sized and postally unused. Condition is mint! #156 RP 40's / 50's La Guardia Airport NY ! Here is a nice old Real Photo postcard view of the La Guardia Airport in NYC ! Easily visible is the ornate terminal building with eagle up top. Vintage 40's taxis drop of passengers. The front of the card reads "La Guardia Airport Terminal". Back is divided and unused, but handwritten with flight info and "Aug 8 1954". Condition is mint!